Bristol Myers Squibb – Duggan Brothers Ltd. 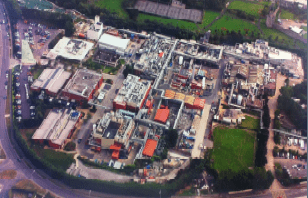 The Hydrojenator Upgrade project involved complex structural alterations of the existing steel and concrete frame, the replacement of the building envelope, the internal fit-out, including partitions, doors, lift, etc., and all internal building finishes at the existing operating plant for Bristol Myer Squibb Company at Swords, Co. Dublin. The works were carried out adjacent to the existing live facility including tie-ins & refurbishment to the existing plant, within a very stringent construction programme. The building structure consists of a steel frame with metal decks to receive concrete floors and external cladding. The steel frame and envelope also comprised significant blast resistant and blast relief elements. Large items of client process equipment including vessels spanning up to three floors had to be installed through the roof & facades at an early stage of the project before the building was fully sealed. The internal fit-out and finishes included fire rated walls, EX rated goods lift, EX rated sectional doors, blast resistant doors, epoxy floor finishes, stainless steel stairs and balustrading etc. The building also included an extensive Process Mechanical, Electrical, Instrumentation and Sprinkler installation packages.